Bubby and Bean ::: Living Creatively: holiday giveaway! Santa has officially paid a visit to Bubby & Bean in the form of a very special holiday giveaway! 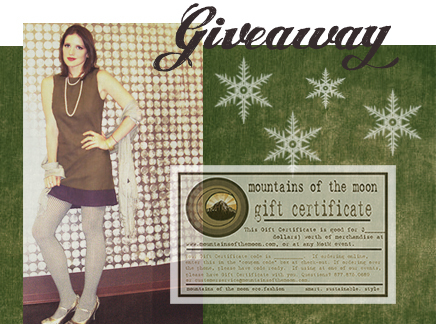 One lucky Bubby & Bean reader will win a $50 GIFT CERTIFICATE to Mountains of the Moon for their very own eco-friendly fashion shopping spree. 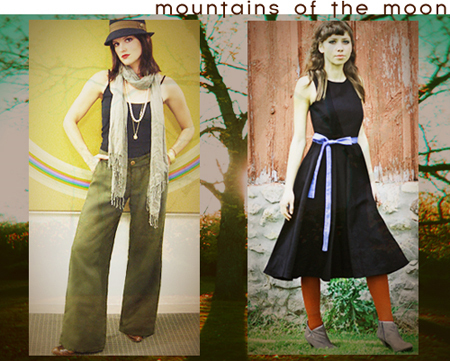 All of Mountains of the Moon's clothing designs are made from sustainable materials like organic cotton and hemp blend fabrics, low-impact dyed, and produced locally. The winner's name will be drawn on Wednesday, December 15th, so make sure to check back Wednesday evening to see if you won! Best of luck! 2. My favorite item from your etsy shop is the Old Dogs Are The Best Dogs Art Print in Seafoam!!! I'm not on facebook or I'd post entries for those too!!! THANK YOU!!! great giveaway! my christmas list #1 item is a dog! yes i want a rescue dog so badly, i just need to convince my husband! other entries: subscribe to bubby & bean, favorite etsy shop item is the je t'aime art block!!! Thanks for having a great holiday giveaway! + Number one right now on the 'Festivus' list is a ticket to Phish NYE. Ooooooh I love Mountains Of The Moon! My first item on my Christmas Wish List is any a lomography camera, a holga or diana. Christy B. again from the last comment, here's my additional entries. Thanks and I'm crossing my fingers! Good luck and don't forget to check back Wednesday evening to see if you won! Number 1 on my list is a weather vane with a chicken on it. Thanks for the the giveaway! a new coffee table, definitely. just a nice, simple, hardwood coffee table. mine's shot! All I want for Christmas is a small gallery & shop in Big Sur... or Nederland. Either place will do-- just get me outta this city! Hi, my number 1 Christmas wish list item is the laser hair removal system by Tria Beauty! My favorite item from Bubby & Bean's Etsy Shop is the Mini Fridge Art - MAGNET GIFT SET of Collage Magnets. I'm a fan of Bubby & Bean on Facebook (FB name: Maddie Brubaker). I'm also a fan of Mountains of the Moon on Facebook. My #1 holiday/solstice/festivus wish list item is to have opportunities to reconnect with dear sister-friends who I haven't seen in ages, to laugh over a delicious meal or coffee and catch up with one another. my #1 xmas wish is for my boyfriend to get the job he's interviewing for today! Yay! What a wonderful idea! What I want more than anything for Christmas is to visit my family in Iowa and big hugs and kisses from my nephews! -I'm a fan of both MotM and Bubby & Bean on FB. -I'm now following this blog. My #1 thing is the house we just put a bid on...yes, I know, very big thing, but it's a great house. It's really ALL i want! I just want decent weather so my son can drive in for Christmas! If you can't see the image, it's a fifty's vintage dress, that is unfortunately faaaar out of my price range. The #1 thing is a kindle. My favorite item from the shop is the SEEK - Original Collage Pendant and Charm - DOUBLE SIDED! Very cute! I follow Bubby and Bean on Facebook! Thuy T.
I follow Mountains on the Moon on facebook! Thuy T.
#1 on my wish list is a pair of boots- dansko would be fantastic- sigh! i gfc follow you now. i love the photo of the old red barn! #1 item on my Christmas wish list this year is health of my nears and dears and my own of course!!! Following Bubby & Bean blog! I like PLAYTIME - Original Mixed Media Vintage Collage Art Block from Bubby & Bean's Etsy Shop! I like Mountains of the Moon on Facebook! I really want a new coffee maker! I would just like some 35mm film. Nothing extravagent. My favorite item from the shop is BIRD SONG - Original Mixed Media Music Collage. Hmmm...I would love a giant box of Lush bath goodies!!! Favorite from your shop: I love the Good Dog giclee! A perfect pair of black boots. They need to magically go with every pair of pants I own, regardless of length or color. I've got you on my google reader now! I love photography. Your vintage barn is beautiful! mmmm...i definitely asked for a ton of smart wool socks...winter in germany is too cold for only a few pair! the art block is my fav from etsy...i LOVE it! My number one item is to move out of my apartment into a house with a yard! (Kinda like the Feist song Mushaboom!). One can dream! I follow you on FaceBook and subscribe to this fabulous blog! ^This is also on my Holiday Wish List!! !